Deeside Steam Rally August 2019. Deeside Steam Rally 2019 takes place over the weekend in August at Milton Field, Crathes. Steam driven vehicles take over Crathes; and invade Banchory town centre; during the annual Deeside Steam Vintage Rally. Additional to steam vehicle events, there also main featured public display events and demonstrations. Working coal fired miniature steam engines form a surreal spectacle in front of the full size traction engines. 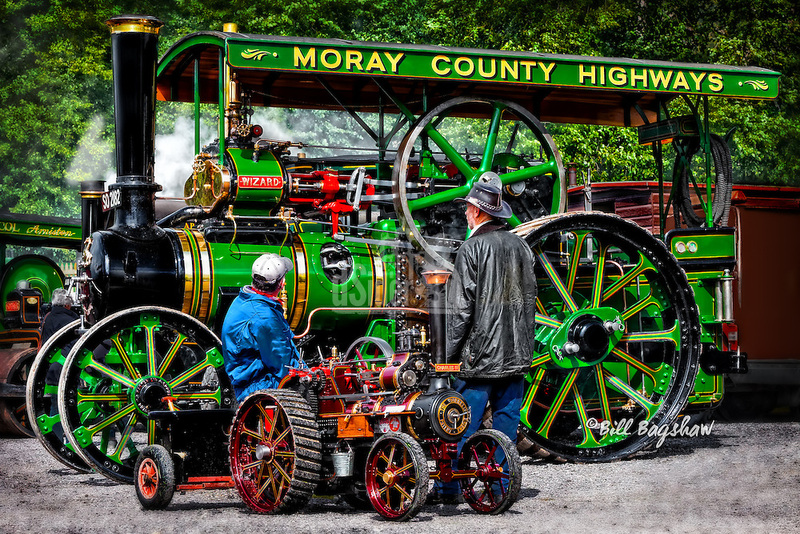 Deeside Steam Rally features steam engines, steam vehicles, vintage tractors, miniatures, vintage agricultural machinery, plus vintage cars and vintage motorcycles. In past years several vintage Aberdeenshire council vehicles were on display including a vintage snowplough. A British World War II field gun; and vintage machine gun carrying jeeps; have previously added a military element to the event.